Whether it’s your whole wedding or just the reception, Party Houses have an array of specialist wedding venues for you and all your guests. Our venues can provide beautiful overnight accommodation allowing you to really carry on the celebrations with your loved ones. Please note that not all our venues have wedding licences (we’ll mark the ones that do). Not to worry, the ones that can only be used for reception have other fabulous churches snd registration offices nearby where you can hold your ceremony. Glowing feedback from our brides has proven just what a fantastic day can be had. 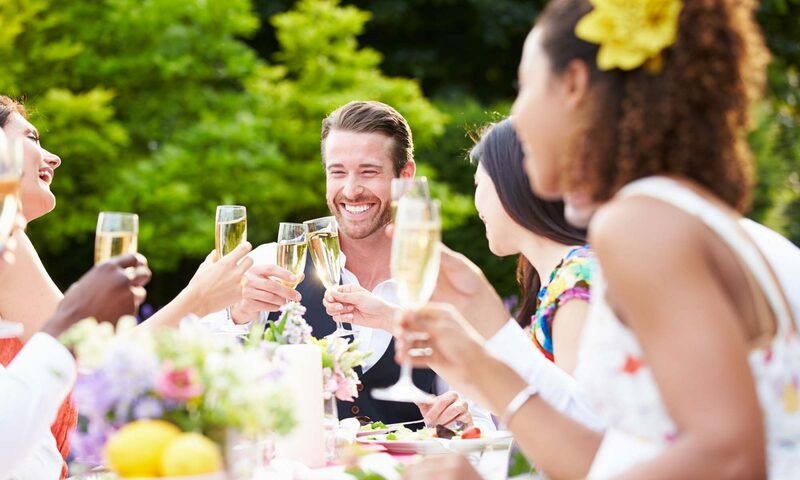 From the delightful meal on the eve of the wedding, to being surrounded by friends & family as you get ready to walk down the aisle, Party House venues can provide a fantastic wedding reception at great value. Self-catering, hog roasts, or professional catering chefs are all options to consider, as well as the possibility to set up a bar tab. Dance the night away at our Party House venues! Check out our Activities and Ideas section for information on Invitations, Catering, Drinks, Photography, Venue Dressing, etc. or call us on 01273 271332 and we will do our very best to help with ideas and contacts. Don’t forget… Party Houses make lovely venues for your hen or stag party too! Sleeping 30 guests, this Party House in Berkshire is a fabulous wedding reception venue in the UK. Dating back to the 1930s, it has a unique design which gives it a lot of character. There are 4 large reception rooms which could serve multiple purposes – pre-party, main ceremony or after-party. If you prefer a ceremony outside you could also use the 3 acres of private gardens for your wedding ceremony. The wide range of facilities will ensure that your guests are entertained the entire time due to the spacious indoor swimming pool with all the necessary amenities, the tennis court with floodlights, gym, dance studio, sauna, steam room and casino. This wedding reception venue in the UK is a great example of a Party House that combines modern and traditional characteristics and is one of our favourite wedding venues. It sleeps 16 guests, but there are 2 on-site apartments by the pool that can sleep an additional 12 guests. The lush green gardens create the perfect setting for a gorgeous wedding ceremony and you get just the right amount of seclusion at this Party House. It offers 4 large reception rooms perfect for afternoon teas, pre-parties or evening drinks. Moreover, there is a spacious terrace that sits 50-100 guests where the wedding reception can take place. You can also use the grill outside and cook some delicious food for your guests. On a bright sunny day, this terrace would serve as the perfect backdrop for fairy-tale like pictures for your special day. Situated in 20 acres of garden space, this gorgeous Party House in Devon comes with a wedding license and can accommodate 70-81 of your guests overnight. Therefore, you get the opportunity to prepare for your wedding, celebrate the ceremony with unimaginably gorgeous backdrops, have your reception with unlimited alcohol with no corkage charges and an entertainment license allowing you to have a loud outdoor band or DJ, and then enjoy a wedding breakfast the next day. Even better, why not celebrate a wedding week at this affordable venue? Furthermore, the basement is soundproof where you can take the party downstairs and dance the night away! You can celebrate your wedding just the way your heart desires and the dining area can accommodate all your guests! If you are looking for a Party House ideal for a fun wedding party, this wedding reception venue is a wonderful option for you. Sleeping 30-33 guests in 9 individually designed cosy bedrooms, this delightful house will give your guests plenty of space and 2 large elegant reception rooms to socialise, relax or party in. For your entertainment, there is a heated indoor pool and a games room. If you want to sit back and relax, save one night for a movie night in the cinema room. On a warmer sunny day, feel free to use the BBQ to make some memories filled with laughter with your loved ones. What’s more? Your pets are more than welcome to celebrate your special day with you. The fully-equipped kitchen will let you display your culinary skills to produce a restaurant quality dish right at your Party House! Sleeping 40 guests, this property in the Peak District is suitable for your wedding celebration. The main reception room can accommodate up to 50 guests and can be used for socialising, relaxing or even to dance the night away! The second reception room is for those who are relaxing away from the main party. Seating up to 60 guests, the dining room is quite large and there is also a second dining room that can accommodate 20 guests. You can hire a caterer with waiters and have a mouthwatering 4-course meal prepared. The two private gardens – both with remarkable views can also serve for the wedding reception. For couples looking for a ‘getaway from it all’ experience for an undisturbed but yet drop-dead gorgeous dream-like wedding, this Party House located under the famous rocks of The Roaches creates the appropriate setting. Surrounded by nature, the serenity in this property is relaxing. The views of the Peak District serve as the perfect backdrop for exceptional photos for the bride and groom and the 8 acres of fields, woodlands and gardens can easily be the perfect area for the wedding reception. Sleeping 30 guests, this property also boasts 2 reception rooms, both of which are spacious and have great views and thus, could be used for pre-parties, teas or drinks. The dining room sits 34, and its expansive windows give you stunning views. If needed, catering services can be arranged. The White Manor is a lavish property located in the Midlands and can accommodate up to 28 guests. This large group accommodation boasts 8 spacious reception rooms, each with a unique design. Additionally, there are spacious gardens where you can have the main wedding reception. Once the even wedding reception is over, the newly wedded couple can head up to the master bedroom and enjoy the spacious jacuzzi for 2 and relax. A personal catering team who will arrange the menu depending on your budget and taste can also be arranged upon request. This enchanting beach house is located in South West Wales and is a fairytale-like wedding reception venue in the UK. With magnificent beach views, your wedding ceremony would be what all the guests are talking about for even months after. You will enjoy a stunning private beach and the perfect amount of peaceful seclusion as it is situated in midst of 10 acres of private gardens and woodlands. The decor is luxurious and there are breathtaking views everywhere, giving you the perfect backdrop for your wedding and many opportunities for great photos! There are 5 reception rooms and this is a pet-friendly accommodation, you can bring your pet to your special day. Chepstow Manor for 24-28 guests is a Grade II listed Party House dating back to the 1830s. If you are looking for the perfect wedding reception venue, this immaculate property will ensure your party is a big success and will leave guests talking about it for long after. The more active guests will have access to an onsite gym, and the ones who like to relax will enjoy their very own cinema room. Furthermore, there is a games room and a bar for socialising. Since its only 30 minutes from Bristol, you will enjoy a serene rural wedding without having to travel too long. The 5 multipurpose reception rooms are perfect for your reception party! This marvellous wedding venue in Yorkshire Dales is perfect for your small and intimate wedding celebration. Sleeping 15 guests, this lovely Party House comes with a wedding license so you can have your ceremony, reception and wedding breakfast right here! If you have above 35 day guests, a marquee can be set up. Moreover, this house brags modern facilities and cosy bedrooms. The reception rooms are traditional and will add a unique touch to your wedding. This house also welcomes your canine friends to come and celebrate your big day with you. Looking for a last-minute wedding venue? Although you might be in a rush, it doesn’t mean you need so compromise when it comes to your wedding venue. This is your special day and we want to do our best to help you have a wedding just as you imagined. Take a look at our Special Offers and browse through our fantastic last-minute wedding reception venues.